Because our Nylvalour velvet ribbon is 100% washable and color safe, it is a perfect choice for costume designers, seamstresses, or anyone working with clothing and garments. Our Nylvalour brand velvet ribbon is also a good choice for jewelry design, floral design, giftwrap and hair bows. 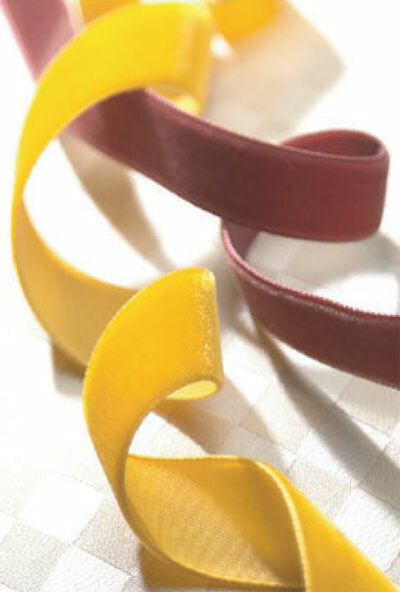 Our Nylvalour velvet ribbon is manufactured in Switzerland by the Morex company and is available in 73 colors and 7 widths. A quality velvet ribbon which does exactly what the name implies. Thus great for head bands or hair bows. A beautiful addition to this year's collection. The beautiful red velvet is studded with lovely silver sparkling snowflakes. Wired, 2 1/2 inches wide and a 20 yard roll.